Many people tend to choose the path of least resistance when it comes to color. However, there is no need to be scared of color. 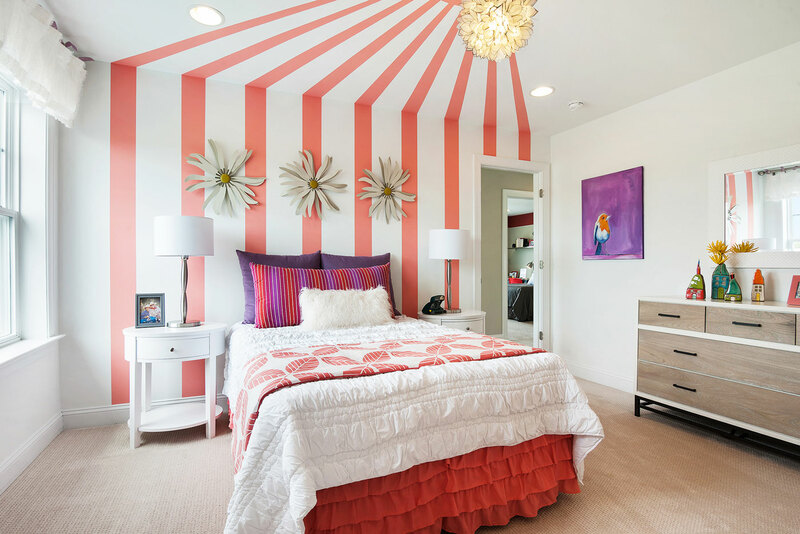 The use of color can be a fun and powerful way to create a mood and elicit a desirable vibe in a model home’s interior. Color can enhance home sales by creating a certain feel for an entire room with just one accent wall. Read more about these design strategies and learn how to lose the fear of navigating new hues. Learn how an interior designer/ merchandiser can help you put it all together, using color in the most strategic way possible to sell more homes. Before choosing color, determine what vibe you want the space to have. In restful rooms where serenity is desired, toning down the shade of color achieves a calming effect. While bold colors create pizzazz and playfulness. When using brighter, vibrant colors, try to limit the competition by keeping other colors to a minimum and pairing with neutrals. When designing a model home you can be a little more dramatic with color choices on items that are easily replaced. A potential home buyer knows they can change the colors of a pillow case or other accessory. If you’ve designed a model home with leopard print tile, well that’s a whole other issue. Bottom line, don’t be afraid to take risks with the less expensive (and more easily replaced) items in your model home. Stepping away from matching can make magic. Colors that are on opposite sides of the color wheel can be juxtaposed to create a dramatic dynamic within a design. A lively, lemon yellow paired with a vivid, deep purple successfully adds a stunning surprise to a space. Trust that your designer knows how to break the color “rules” to create a beautiful space that sells. For more ways to use color to enhance home sales and how an interior merchandiser can help, please contact us today. And, be sure to follow us on Facebook, LinkedIn, and Instagram for all kinds of creative color design ideas.